The state of Telangana, in southern India is divided into 33 districts. A 'district' in the state of Telangana is an administrative geographical unit, headed by a District collector, an officer belonging to the Indian Administrative Service.. In terms of area, Bhadradri Kothagudem is the largest district with an area of 7,483 km2 (2,889 sq mi) and Hyderabad is the smallest with 217 km2 (84 sq mi). Hyderabad district is the most populated district with a population of 39,43,323 and Mulugu is the least populated with 2,94,671. Telangana consist of 68 Revenue Divisions and 584 Revenue Mandals(Tehsil). Telangana region of Hyderabad State did consist of 8 Districts in 1948 when it was inducted in Dominion of India; they are Atraf-i-Baldah (Hyderabad), Mahbubnagar district, Medak district, Nalgonda district (Nalgundah), Nizamabad districts, Adilabad, Karimnagar, and Warangal districts..
Khammam district was created by bifurcation of Warangal district on 1st October 1953. Andhra Pradesh was formed by merging Telangana region of Hyderabad State and Andhra state on November 1. Bhadrachalam division and Aswaraopet taluka parts was merged in Khammam district from Godavari districts for better Administration. 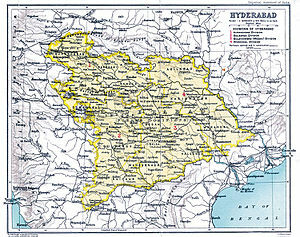 Hyderabad district was split into Hyderabad Urban District and Hyderabad Rural District on 15 August 1978.Hyderabad Urban District was made by 4 Talukas are Charminar, Golkonda, Mushirabad and Secunderabad Talukas which consist of only MCH area, Secunderabad cantonment and Osmania University. Hyderabad rural district was later renamed as Ranga Reddy District. Telangana curved out from with 10 districts from Andhra Pradesh. Seven mandals of Bhadrachalam division were given back to East Godavari district. 21 New districts were created on 11 October, which lead to 31 districts in Telangana. All districts were divided into minimum 2 to maximum 5 except Hyderabad district which was untouched. Two new Districts, Mulugu and Narayanpet were created on 17 February, taking the total number of districts to 33. Narayanpet district has 11 mandals. ^ "Telangana govt carves out two new districts, Narayapet and Mulugu". www.thenewsminute.com. Retrieved 2019-02-17. ^ Yazdani, Ghulam. "Hyderabad State". Atlantic Publishers & Distri – via Google Books. ^ a b "Know Your Corporation". ^ Law, Gwillim (2011-09-25). "Districts of India". Statoids. Retrieved 2011-10-11. ^ "New districts". Andhra Jyothy.com. 8 October 2016. Retrieved 8 October 2016. ^ "Telangana gets two new districts: Narayanpet and Mulugu". The New Indian Express. Retrieved 2019-03-31. ^ "Medchal-Malkajgiri district" (PDF). Official website of Medchal district. Retrieved 20 March 2017. ^ "Vikarabad district". Official website Vikarabad district. Retrieved 31 March 2017. This page was last edited on 16 April 2019, at 10:13 (UTC).